Policy Innovation Memoranda target critical global problems where new, creative thinking is needed. The Donald J. Trump administration is seeking to make UN peacekeeping more efficient and effective. As part of its reform efforts, the administration should increase women’s representation in peacekeeping operations. Women are routinely underrepresented in peacekeeping operations, even though their participation has been shown to improve mission effectiveness and advance stability. Countries around the world deploy women to the United Nations at levels far lower than they are represented in domestic security forces. To address this gap, the U.S. government should support a financial premium given by the United Nations to police- and troop-contributing countries to increase the training and deployment of female peacekeepers. Women make unique and substantive contributions that improve peacekeeping operations. Female peacekeepers frequently can access populations and venues that are closed to men, thereby improving intelligence about potential security risks. They are also better able to screen women during searches, helping to close a security loophole that extremists increasingly exploit. In addition, the presence of female officers improves access to community members, thereby amplifying situational awareness and helping military commanders fulfill their mandates, including the protection of civilians. Women’s participation in security forces improves dispute resolution. Female police officers are less likely than their male counterparts to use excessive force and are far more likely to de-escalate tensions and build trust with communities, thereby advancing stability and the rule of law. Women’s participation in the security sector is associated with fewer misconduct complaints and improved citizen perceptions of force integrity. For example, in Namibia, Rwanda, and South Africa, local populations perceived female police peacekeepers to be more effective at de-escalating potential violence, less threatening, and more receptive to civilians. Greater gender parity in peacekeeping forces also reduces the risk of sexual exploitation and abuse, crimes that weaken local and international support for multilateral peacekeeping operations critical to U.S. and global security. Estimates suggest that increasing the proportion of women in military peacekeeping units from 0 percent to 5 percent reduces abuse allegations by more than half. A visible presence of female peacekeepers has been shown to empower women and girls in host communities and can raise women’s participation rates in local police and military forces, which in turn improves the capacity of national forces to take over security responsibilities from peacekeeping missions. 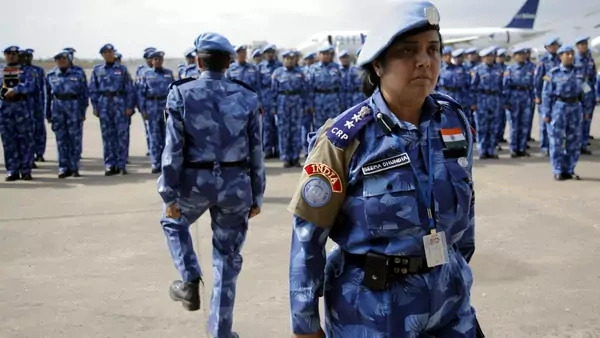 In Liberia, for instance, observers attributed an increase in women’s participation in the national security sector—from 6 percent to 17 percent over nine years—to the example set by all-female police units deployed as part of the UN peacekeeping mission. Despite evidence that including women improves peacekeeping efficiency and effectiveness, they are routinely underrepresented in actual operations. The rate of female participation in peacekeeping forces has changed slowly over the past quarter century, growing from 1 percent total in 1993 to just 4 percent of military peacekeepers and 10 percent of police personnel in 2017—far short of the UN targets of 15 percent and 20 percent, respectively. Nearly half of all troop-contributing countries do not contribute any female military observers or staff officers whatsoever. Nearly half of all troop-contributing countries do not contribute any female military observers or staff officers. Some nations contend they lack a sufficient pool of qualified female peacekeepers, but countries—including twelve surveyed in one recent study of twenty-one police and troop contributors from all regions of the world—deploy women to the United Nations at levels far lower than their proportion in the same countries’ domestic security forces. Anecdotal evidence suggests that many countries either do not nominate women qualified to deploy to peacekeeping operations for relevant training or train but do not deploy them, because of the conscious and unconscious biases of their superiors. Thus, even if the share of women eligible to deploy rises, police- and troop-contributing countries are unlikely to increase the deployment of female peacekeepers without additional incentives. The United Nations already employs financial premiums in peacekeeping, primarily to encourage troops to deploy rapidly or to high-risk areas. Given the returns from women’s participation in peacekeeping, a similar mechanism should be used to incentivize their increased deployment. UN Security Council Resolution 2242, adopted in 2015, endorsed such incentives to bolster female peacekeepers, but little has been done to implement it. To close this gap, the United Nations should pay a premium to police- and troop-contributing countries based on the percentage of high-ranking women they assign to each contingent, ensuring that women have the opportunity to serve in influential roles, such as on patrols or as planners. The United Nations should also make that premium contingent on other reforms, such as police- and troop-contributing countries enacting specialized training on gender issues and rigorous vetting procedures to exclude individuals with a history of sexual exploitation. Such an incentive structure would improve the operational effectiveness, accessibility, and credibility of peacekeeping missions by providing personnel with diverse perspectives and a broader range of skills. It would also encourage improved training on core responsibilities, including protecting civilians from conflict-related sexual violence. Such reforms would improve the performance of peacekeeping missions, and the burden for these investments could be shared among UN member states—two objectives of the Trump administration’s peacekeeping reform agenda. Support the launch of a pilot fund at the United Nations. The United States should support a UN voluntary multi-partner pilot fund to increase the deployment of female peacekeepers. The U.S. government should contribute $15 million, matching a recent Canadian commitment as part of the Elsie Initiative for Women in Peace Operations, to support such a fund. This fund will enable consultations with police- and troop-contributing countries to establish specific incentives that could include results-based payments, additional training or deployment slots, and public recognition through performance awards. To accompany this pilot fund, the United Nations should conduct country-specific analyses of barriers to women’s participation in security forces and their deployment as peacekeepers. The pilot fund should then monitor and evaluate the deployment of female peacekeepers in the field. Based on results from the pilot phase, the United States could recommend that resources be drawn from existing mission budgets as occurs with other peacekeeping premiums. This approach would not undercut ongoing U.S. efforts to decrease the standing peacekeeping budget, provided that trade-offs are identified when the premium is introduced. Strengthen performance measures. Current UN performance measures do not track the number, rank, or function of female peacekeepers, whether the units were trained to prevent conflict-related sexual violence, or whether vetting systems correctly identify peacekeepers credibly suspected of sexual exploitation and abuse. The United States should push for each of these factors, which are critical to the fulfillment of peacekeeping mandates, to be added to the United Nations’ performance system. The United States should press member states to increase the number of women in the peacekeeping pipeline. Increase the number of women in the peacekeeping pipeline. In parallel with this financial premium, the United States should press member states to increase the number of women in the peacekeeping pipeline. As a practical step, the U.S. government should partner with at least five police- and troop-contributing countries to launch new initiatives to recruit and retain women in their national forces. The U.S. government should further require that women represent at least 30 percent of local participants in U.S.-led military and police peacekeeper training programs worldwide. Similar initiatives have already shown success: from 2011 to 2016, partner countries in the U.S. Global Peace Operations Initiative (GPOI) increased their deployment of female military peacekeepers by 62 percent, as compared to a 24 percent increase among non-GPOI partners. Critics may allege that women are underrepresented in peacekeeping missions because few actually want to serve in military or peacekeeping roles. To be sure, some women will not want to deploy to a peacekeeping mission—because of other career opportunities or family constraints, for example—but this is true for men as well. Arguments suggesting a scarcity of qualified women ignore evidence that many nations currently have women who are qualified to serve but are overlooked for training and deployment opportunities, or are unaware of such opportunities as these are often shared through informal networks. Critics may also argue that deploying more female peacekeepers will decrease unit cohesion and increase sexual violence within units, and thereby decrease effectiveness. In fact, female peacekeepers improve unit performance and help military commanders fulfill their mandates. Increasing the representation of female peacekeepers also mitigates sexual violence and abuse in the field. The Trump administration has cited peacekeeping reform as a top priority, and it is pursuing changes intended to make peacekeeping operations better able to deliver on their critical mission of promoting security and saving lives. As it pushes missions to be more effective and less costly, the U.S. government should ensure that peacekeeping operations make the most of a perpetually overlooked resource: female military and police officers. By increasing the participation of female military and police officers—to the UN targets of 15 percent and 20 percent, respectively—peacekeeping missions will benefit from improved intelligence, better community relations, and reduced risk of abuse, with minimal additional cost up to an annual cap of $40 million, which constitutes just 0.5 percent of the entire peacekeeping budget. To advance operational efficiency in peacekeeping, the Trump administration should lead the effort to reform UN peacekeeping by establishing a premium for countries that increase the number of female peacekeepers they train and deploy. A voluntary multi-partner pilot fund will ensure that the financial burden is shared with other countries, while incentivizing police- and troop-contributing countries to make the concrete policy changes required for effective reform. This publication was made possible by the generous support of the Compton Foundation. The Council on Foreign Relations takes no institutional positions on policy issues and has no affiliation with the U.S. government. All views expressed in its publications and on its website are the sole responsibility of the author or authors. Welcome to “Women Around the World: This Week,” a series that highlights noteworthy news related to women and U.S. foreign policy. This week’s post, covering September 26 to October 1, was compiled with support from Rebecca Turkington and Ao Yin. While recurrent armed conflicts, expanded extremist networks, and record levels of displacement remain defining features of global security, standard peacemaking methods continue to overlook a proven strategy to reduce conflict and advance stability: the inclusion of women.